Refurnished and newly painted in 2016, this grand oceanfront home is the perfect blend of luxury and comfort. High end appointments, from the tile floors to the custom cabinets, countertops and mouldings, are balanced with plush furniture, multiple living areas and stunning ocean views from both levels. 8 Flotilla offers exceptional amenities, such as private pool (can be heated for additional charge), spa, gas grill, 2-car garage, two fireplaces, multiple balconies and outdoor sitting areas. The home features six bedrooms, six and a half baths and sleeps up to 18 guests. The 1st floor of this home features the perfect gathering area with a family room and fully equipped wet bar. The family room has a horseshoe shaped sectional sofa, large screen TV, game table and chairs and ocean views, and the bar area has a refrigerator, microwave and bar stools at the counter. The bedrooms on this level include a Master with king bed and ocean views, a Guest bedroom with king bed and ocean views and a Guest bedroom with a queen bed and separate daybed with trundle. The laundry room is also on the first floor. 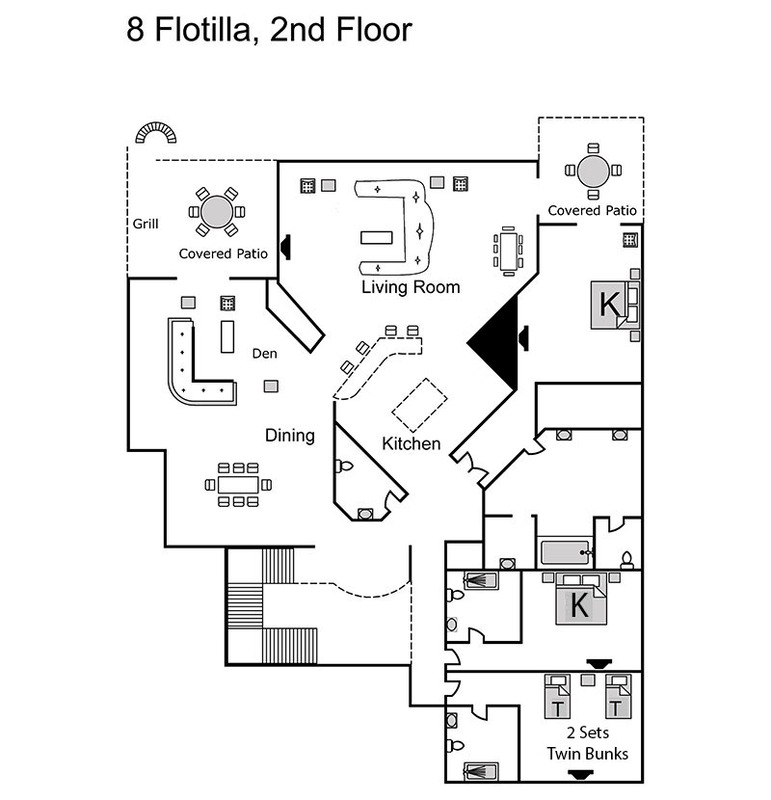 The second level was designed to fully capture the ocean views and features a living room with sectional sofa, cathedral ceilings and large windows, adjacent breakfast area, gourmet kitchen with bar stool counter, formal dining room and a second den with oversized chair, sleeper sofa and private balcony overlooking the ocean. The second level bedrooms include a Master suite with king bed and private oceanside balcony, Guest bedroom with king bed and private bath, and a Guest bedroom with 2 sets of bunk beds (4 twin mattresses). All bedrooms on both floors have private full baths and their own flat screen TV's. The oceanfront pool is 16x32 and features a raised Spa. Spa heat is included with your rental and the pool can be heated for an additional fee. The sunny pool deck offers lounge chairs and tables for the perfect vacation experience. The house suited our needs perfectly!! The air conditioner in the upstairs main room wasn’t working well but a call to Destination Vacations solved the problem. We will definitely rent this home again! Exquisite accommodations and service made for a most memorable experience! Outstanding property. Worked perfectly for our family. My husband and I chose this house for our 50th anniversary celebration with our 3 adult children, their spouses & our grandchildren. It was perfect with ample space for everyone. The master suites with beautiful views and bathroom with each provided the privacy the adults wanted. The smaller lower level kitchen was helpful late at night as well as for early risers each morning. The proximity to the beach and the very nice pool with volleyball net were appreciated and enjoyed by all. The kitchen was very well stocked with cookware, utensils and ample dishes and glassware for a large group. The large washer and dryer in the laundry room was put to good use especially with the kids and beach towels that we took. The linens provided for the bathrooms were quite nice quality but again we appreciated the washer and dryer since we had 2 sets per person for the week. We had three cars and parked two in the garage (where ping pong table is set up) and one in pull in area near front door. No problem having space for all 3 vehicles. Our experience renting with Destination Vacation was extremely positive from the days we spent researching the area thru check in date to departure. There were a few minor glitches with the house the day we checked in, but all it took was a phone call to their office, and all was resolved ASAP. Gail was especially helpful in answering each and every question about the house that we had prior to our arrival. We would have no qualms about leasing with Destination Vacation in the future and will recommend them to others.